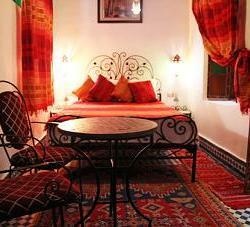 Dar Hafsa is a conventional 19th century Moroccan home. Recently redesigned, the home is a stunning example of fine Moroccan craftsmanship. The ornate tile work and painted doors reflect the top in cultural design. An open floor plan with multiple indoor balconies gives the home a cozy feeling, but not in the expense of privacy. A roof-top rooftop offers an expansive view of the Fes Medina as well as the Riff Mountains. Absolutely everything was perfect, we could not of made a much better decision to stay with Abdul and his staff. So friendly and generous. There&'s absolutely absolutely nothing negative to say about this Riad. The home is totally clean. The lady running the Riad was there to answer any inquiries any time. Really best breakfast breakfast we had in Morocco so far with a massive selection of Moroccan pastry. When we arrived in Fes the property owner waited for us at the gate of the Medina, and took us to The hotel through the small streets. The hotel looked amazing and was really clean. Our airconditioning worked perfectly. The employees of The hotel were all really Nice and making sure we had a very good time. Everybody speaks English in The hotel which was a Nice bonus. The property owner helped us with an official guide from The city to show te Medina. He Also advised us for very good eating places with great scenery and very good Food. A tour was arranged for us from Fes to Marrakech going through Merzouga, todra Gorges and A&&iuml;t Benhaddou in a really cozy car with a nice driver who was also really accommodating. I got sick on The first night and The property owner consistently called us to make sure we had everything we needed, The driver took us all over Morocco for The right pharmacie and whenever we wanted to stop for pictures, water or lunch he took us to a very good place. If you are ever in Fes please go to this hotel, The Owner is The nicest and most sincere man we have met in Morocco so far. One of our really best hostel experiences, ever: Dar Hafsa is clean, comfortable, and its location and service can not be beat. Our host provided a warm welcome, and continued to present advice and support throughout our stay. We loved the delicious breakfast served every single morning, and mint tea served on the rooftop terrace every single night. We only wish we had more time to stay in Fez! Owner and employees extremly helpful and friendly. They arranged for someone to collect us from the main gate and take us to the Riad as the medinia can be slightly confusing the first time. Breakfast was really good, a lot more than enough food and really properly prepared. Beds were comfy as properly as the showers ere hot. Could not have asked for far better accomkdation. strongly recommend! Friendly and helpful people, really clean, great breakfasts, Moroccan decor, great location. Excellent service with an awesome location inside the medina with a really traditional feel. Very welcoming host and helpful employees who go out their way to help you. Beautiful house and brilliant location. Plentiful breakfast. Highly recommend. Amazingly helpful owner/staff - really made the trip the awesome encounter it came to be! The people are what makes this guesthouse so special. In addition, the location is perfect. The roof top terrace gives ample viewing across the city. Photographers will really like the golden hour of light beaming over the skyline. The style and decor of the building overwhelms those looking for a true Fez vibe. Suggestions from staff should not be ignored and helped us to value the little time we had. I imagine already returning one day in the future. The whole household made us really feel at house and has made our first time to Morocco unforgettable, I now understand first hand why there are so a lot of good reviews! Also, extremely safe area, lots of lighting and warm and friendly people. Dar Hafsa is in a fantastic location inside the medina. We felt extremely safe, even at night, and really enjoyed staying in this stunning Dar. We really appreciated Karim meeting us at the blue gates and walking us to the Dar following a long, hot journey from Chefchaouen. The greatest thing about Dar Hafsa is the people. Karim and his family were so welcoming and friendly that following just one night it felt like home. Karim organised a tour guide for us and suggested we do the full day tour. We were sceptical about the full day tour and originally arranged to do a half day, but the tour was so good - our tour guide, Noureddine, was superb - and there is so much to see in Fes that we ended up changing to a full day tour. Karim was right! Our stay coincided with Ramadan and the football globe cup, and we had one of our greatest evenings in Morocco sitting at Dar Hafsa, watching the football, drinking mint tea and talking with Karim and his son, and the extremely helpful, funny and friendly night porter, Mohammed. They were also kind enough to share the evening break-fast with us, which was amazingly tasty and a fantastic experience. Each day we were served a delicious large breakfast and the accommodation was superb value for money. Basically, if you are going to Fez and looking for comfortable, affordable accommodations we extremely suggest Dar Hafsa. Very very friendly, outstanding staff and outstanding breakfast. The most effective dar in morroco. This was my second visit to dar hafsa and will be back next year. * Dar Hafsa rated 5 out of 5 based on 13 customer reviews. Hostel reviews with a star rating are sourced from HostelBookers. If you find Dar Hafsa with the same booking conditions at a lower rate somewhere else on the internet after you have booked, we will refund you the total difference.